Also called “Sharks and Minnows,” this game is great for all ages. A group of caribou line up on one side of the tundra and a few hungry wolves gather in the middle. The wolves yell, “Ski caribou ski”! The caribou must cross the tundra and reach the other side without getting tagged (eaten) by the wolves. Caribou who are tagged become wolves. The game is repeated until there is only one caribou left. The last caribou is the wolf for the next game. What’s the number one game played and adored by everyone living in the Arctic? Basketball of course! So how do you get a bunch of students excited about skiing? By playing basketball on skis! There are two versions of this game. Ice Basketball is played exactly like basketball except that players are wearing one or two skis and there is no movement when a player has the ball (i.e. no dribbling and definitely no traveling, the ball must be passed to move down the court). The game can be played on an outdoor basketball court or with garbage cans for baskets. Ski Ball is played like Ultimate Frisbee, but with a ball and players wear one or two skis. Two teams face off in opposite end zones and try to advance the ball by passing. If a pass is incomplete or intercepted, the opposing team gains possession and advances in the other direction. If the ball is advanced into the end zone, the team scores a point. 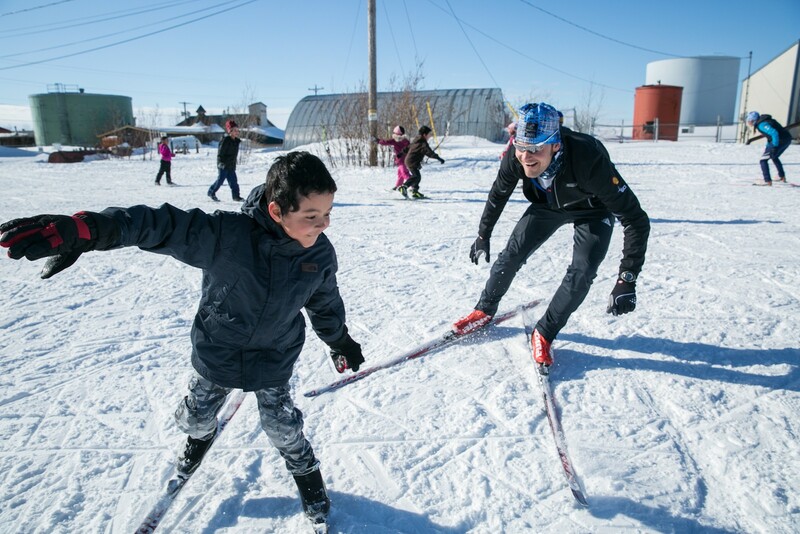 Each Skiku coaching team has a qualified Biathlete to share their sport with students. For demonstration, students participate in a Basketball Biathlon. A Biathlon “range” is made from garbage cans and basketballs. The basketballs are placed at an adequate distance from the can. Two or three skiers (however many cans/balls there are) line up at the starting line and race around a short course. The skiers then enter the range, drop their poles, and shoot two or more baskets. If they miss, they must do a “penalty loop.” They finish by doing another lap around the race course.